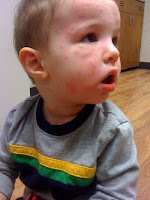 On February 12th, Landry went for his 15 month check up. He was diagnosed with a double ear infection (may I add, it was his first time to EVER be sick) and also got 3 shots. 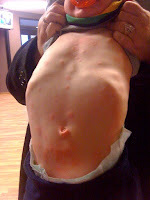 He was put on Amoxicillan for 10 days. Satuday morning Landry woke up, ate breakfast, took his medicine, etc, etc. About an hour after he had been up, I went to change his diaper. I noticed on his groin area some little red raised bumps, I raised up his shirt and he had some on his chest. Finally a little after 1, I called our pedi's doctor that covers for her on the weekend. They refused to make me an appointment and told me to give him benadryl. I called back at 3:15 and they had already closed. So, I called the on call doc again, was told it would cost me $15 to talk to a doctor and that they only called them at the top of the hour. Seeing as how I was really upset the (only) nice nurse went ahead and connected me to the on-call nurse. 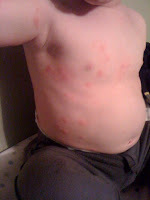 She told me it was a viral infection and that it was extremely contagious, and wouldn't be related to his antibiotics. 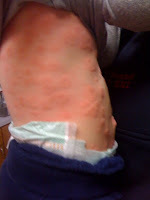 But it just had to work it's course and give him benadryl if he started to itch. I only slept a total of about an hour that nite. The doctor was furious that the on call nurses had blown me off. He said he had a severe reaction to his antibiotic and that someone should have seen us yesterday. He gave Landry a steriod shot and a steriod liquid to take, which hopefully would clear it up, but he still had ear infections and we needed to call his pedi. first thing this morning. We treated him to donuts after the doctor and he found another one in the afternoon! He was actually better yesterday evening and we thought the steriod was really gonna knock it out... WRONG! So, his pedi worked us in this morning. They couldn't believe how bad he was. I'm supposed to keep him on his steriod until Tuesday night, she prescribed a antihistamine that is stronger than benadryl to take for 2 weeks and then he is to start a ZPack on Wednesday for his ear infections. She said the rash could last off and on for weeks. Needless to say, there is now notations on his records that he is not to take medicines in the penicillin family due to extreme reactions. 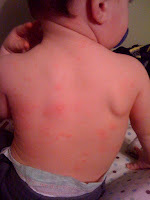 Oh, and they called the on call pediatricians, and let's just say, I don't think it went well! On a cuter note, we hung out with Landry's girlfriend Saturday nite and they totally made out all nite. Notice that Landry rubs Ella's feet, Em had been teaching him how to do that!! Hope everyone has a fabulous day and I hope our week is a lot better!!! Oh, True pre---arranged True love....Cute videos. Hopefully the new medicine will start making him feel better. I know he is miserable. I'm so mad at people treating others this way! Poor baby! The 5th picture is the worst! :( So glad he is feeling better! I was so sorry to hear Landry is not feeling good. It does take awhile for the infection to heal. I hope he can be free of the pain real soon. We didn't need another snow storm so soon.Hope everyone else will stay well. Love, Grandma L.